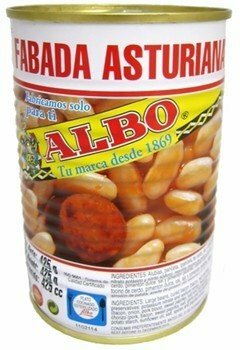 Fabada asturiana, often simply known as fabada, is a rich Spanish bean stew, originally from and most commonly found in the autonomous community of Principality of Asturias, but widely available throughout the whole of Spain and in Spanish restaurants worldwide. Hearty, satisfying fabada stew is the pride of Asturias. Chorizo and morcilla sausages add a rich, smoky flavor to the famous fabada beans. These buttery, smooth beans have an uncanny ability to absorb the flavors of all the other ingredients. Once a simple country dish, fabada is now a venerated symbol of the region, and great care is given to the quality of each ingredient. We offer all the ingredients you need to prepare this classic cool weather dish. The purest in tradition and quality. Since 1869 ALBO has built reputation and unparalleled prestige on the superb quality and tradition of its products.